I first read this book in manuscript form, because Kate is a long-time (I could hear the objections over the water and out of the future when I considered writing “old”) friend of mine. When it got published – last year! – Kate sent me a copy with the inscription “at last” – and at last I have got around to reading it. Of course, I remembered the awesome denouement, which meant I didn’t get the same thrill as I did the first time through; nonetheless it was still a wild ride. One of Kate’s great talents is an ear for odd, rhythmical, and charming description. She links together sometimes outrageous words to compose a scene, drawing in visuals and sounds and even scents to bring together a very real, if whimsical scene: “colder rays and tentacles of witch light fountained, splashing in an ever-widening search pattern over spines and shelves, turning the cobwebs infra-blue…” (34). She also has a habit of incorporating music and lyrics into her stories, sometimes making connections that seem quite peculiar unless you’re able to follow the devious turnings of her brain and keep up with the pop culture references. As to plot – it’s urban fantasy, I guess? The chief characters are Josh, who appears to have no memories older than a few months; his new employer, Scarlet, a Nichtthane – someone responsible for keeping the bogeymen away from humanity; and Kelly, Scarlet’s seneschal, largely responsible for keeping Scarlet herself away from humanity, at least until she’s appropriately caffeinated. There’s a lot of banter and discussion of shoes in between dealing with vampires, were-creatures, and other, less immediately recognisable, supernatural critters. The common thread through it all, at least in theory, is Josh and his past; actually though I think Scarlet and Kelly’s relationship is the more interesting, as Scarlet continues to deal with being nearly immortal and Kelly shows that although intensely loyal, he doesn’t belong to Scarlet – there’s a wider world requiring attention. These stories were initially written as short stories, and sometimes it feels like it. Overall, though, they do hang together nicely. I was also amused, of course, to recognise two of my very own connections to Kate within these pages: a vampire with a tshirt reading “it’s all liminal to me” – liminal being my very favourite word and one I’ve made Kate roll her eyes over too many times to count; and another character wearing a tshirt reading “Dear Pluto, no matter what they say you’ll always be a planet to me” – a tshirt that I own, courtesy of the author. Does this mean that I have been Tuckerised?? This is my first review for the Australian Women Writers Challenge for 2013! 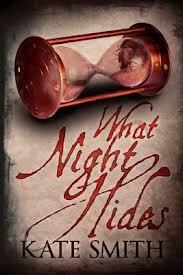 You can buy What Night Hides at Fishpond. Did you know blue has been the favourite colour of Westerners over the last couple of centuries? This book is and intriguing idea, although not entirely well executed. I enjoyed the broad sweep of time that Pastoureau attempted to cover – the Neolithic and ancient use of colour very briefly, the medieval world and on in a bit more detail – because the comparison across hundreds of years is fascinating. Unsurprisingly though, this was also one of its downfalls, since the occasional times it treated an idea or subject in detail it felt out of place; and the lack of detail in some areas annoyed me. In some ways this felt, perhaps deliberately, like this was a preparatory work; a number of times Pastoureau raised questions as areas requiring further research, or mentioned medieval manuscripts that have yet to be transliterated or studied in any fashion. In appearance this is halfway between a history book and a coffee table number. It’s beautifully presented, and the pictures themselves are delightful – most pages have one or two, sometimes three, pictures, illustrating some pertinent point about where and how blue was being used, or other uses of colour at relevant points. But the text is too dense to really work as an art book, while it’s not long enough somehow for it to feel like a really serious treatment of the subject – especially not over such a vast span of time. 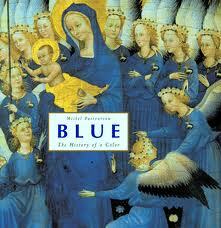 As a history book, I remain unconvinced by some of Pastoureau’s suggestions about how blue worked in culture. The lack of blue in very early art, Neolithic right through to much ancient illustration, is curious but I didn’t entirely buy his explanation for its lack of symbolism and therefore appearance and I’m not sure why. Perhaps it just didn’t feel explained enough to accept such a radical idea. This problem permeated much of the text, in fact; the sober, moral overtones that blue acquired thanks to the Protestants, as well as the issues discussed around its symbolism in the later medieval period, were presented as a little bit too definitive, a little bit too unarguable, for me to be entirely comfortable. Clearly Pastoureau was not setting out to write the definitive work on the colour; he himself points out that a vast amount more work needs to be done in a whole range of areas before such a thing is possible. And perhaps it’s also a fault of translation; maybe there was a bit more uncertainty in the original French? Anyway, overall this is a fascinating book that has made me think about colour and its uses, but not entirely satisfactory.